Networking — it’s a word that excites some people and triggers a feeling of dread in others. There is no doubt that networking can be an incredibly effective trick in your marketing arsenal but it’s one a lot of entrepreneurs don’t use effectively. These networking strategies for entrepreneurs will help! Let’s face it…as entrepreneurs, no matter what your industry, you are in a relationship business. It’s all about building a relationship with our clients. If you want to grow your referral business, it’s time to start looking at building relationships with other business people and expanding your network. If you are going to networking events looking to “get clients,” chances are you have gone home disappointed. If you can shift your focus from “getting clients” to building relationships, you are on the way to making networking actually work for you. Remember, it’s not about the people in the room, it’s about the connections that each of those people can unlock for you! There are lots of different options for networking. Start with looking at your Chamber of Commerce or local business association. Organizations like BNI, National Association of Women Business Owners or 1 Million Cups. Also check out MeetUp.com for networking opportunities in your area. There are often niche networking groups to be found there, some of which take a bit more social spin rather than a “strictly business” feel. That can often be a great way to get started since it feels a little less serious. Let’s start with your name tag. When handed a sharpie and a “hello my name is” sticker, most people will write their full name and business name on it. Don’t do that! Make it easy for people. Put your first name and describe what you do. A name tag that says “LORI — Business Coach” or “KATE — Honeymoon Specialist” is far more likely to get you noticed than one that has a bunch more writing on it. Speaking of your name tag, do you know where it should go? Most people will put it on the left side of their chest but that’s not really the best place for it. Ideally it should go on the right side. Why? Because when you extend your hand to shake theirs, their eye is drawn to that side. They can easily see your name tag and your face that way. Don’t get caught in the food trap! If the event you are attending has buffet style finger foods available, steer clear of it. If your hands, or worse your mouth, are full when someone approaches you then you are left juggling everything and can be faced with an awkward moment. Have an exit strategy. We’ve all “been there” where you get stuck talking to someone who keeps rattling on and on and you can’t escape. Don’t let yourself get stuck. Just politely say to them “well, I know you came to network, so I don’t want to monopolize all of your time! I’ll let you circulate and we’ll catch up sometime later and chat then.” They won’t argue that. Have your elevator speech ready to go. Your answer to the “what do you do?” question should be short and engaging. It should clearly define who your ideal clients are and what you do for them. “I’m a luxury travel specialist. I help working professionals escape from the stress of everyday life with a vacation where they enjoy red carpet treatment at some of the worlds finest resorts and destinations” or “I am a small business systems strategist. I work with service based entrepreneurs to help them save 2 hours a day in their business through my Revolutionary Productivity Process.” (that last one is from my friend Katie over at FullSpectrumProductivity.com but I thought it was so awesome I had to use it as an example here!). Don’t let fear of speaking stop you! It seems like this is the #1 thing I hear from clients as to why they don’t want to attend their chamber events, a BNI group or other networking opportunity. A lot of times each person, or sometimes just newcomers, are given 30 seconds to 2 minutes to give an introduction and tell everyone about their business. If this has you feeling lightheaded just to think about it, take a deep breath. Write your intro on an index card (or cards!) in big, bold print. Stand up and BE REAL. Just say “Please forgive me. This is really outside of my comfort zone so I hope you will bear with me and help me get through this.” Then read your card. You will be amazed at how people respond to you being so authentic and genuine to admit your fear and do it anyway! Being that real and authentic is always very client attractive. Then next time it will a little easier and before you know it you’ll be speaking like a pro! Ask for directions. Every networking group has a few members who are just natural born connectors. They love to give recommendations when they hear someone is looking for a resource. It’s one of their unique gifts. Speak to the leader of the meeting and ask who the power networkers are and make sure you connect with them as soon as you can. They will likely refer you to others who will be the best connections for you. Always get the card. When you meet someone who wants to connect with you or to pass along your info to a friend, they usually ask for your card. That’s great, but that puts them in the driver’s seat. Ask for their card as well, that way you have their contact info to follow up with them rather than just waiting for them to reach out to you. Set up a coffee date. One of your goals for the event should be to pick a handful of people and schedule a one-to-one meeting with them shortly after the event. Meet for a cup of coffee and a quick chat. Ask them about their business and about what an ideal client or lead looks like to them. Keep this in mind so you can refer business to them whenever possible. When you ask about their business and how you can help refer to them, they will reciprocate and ask the same for you. Get involved! Show up for meetings consistently and regularly. That’s how you’ll start to really develop relationships and that’s the key to driving business while networking. It’s not a “one and done” sort of thing. If you are looking for something you can do to attract some new clients in a relatively short period of time without a big investment in marketing expenses, networking may just be your answer! Get out there and find some opportunities in your area! 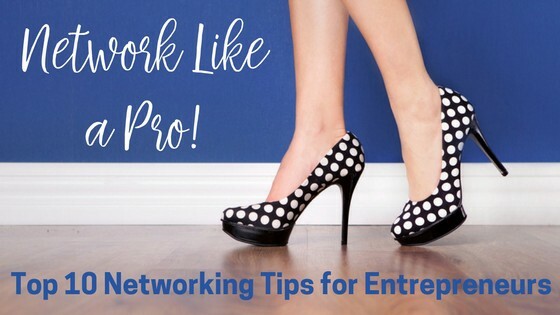 These networking strategies will help, I promise! Has networking worked for your business? I’d love to hear your success story! Share it with me in the comments. Originally published at thevisibilitysolution.com on November 6, 2014. I help #entrepreneurs grow their online presence, get more clients and make more money! Mom of 3 boys, lover of travel, music and anything that makes me laugh!